I really never did get the saying my sister from another mother – not because I did not understand the meaning, but because I did not get the sentiment. I grew up with someone – from when we were 3 to when we were 23 we were like a married couple. And when that relationship ended, it was more like getting divorced than losing a sibling. Then, the other day a reply to an email popped into my inbox “I cannot imagine a time when you were not part of my life”. And then, I GOT IT. I have a friend who is so much more than a friend. She is like my sister. It is as if she has always been a part of who I am. I am ‘friend shy’ and so I don’t always make a move friendship wise. I fear rejection. And yet, with this person, I know she is more than my friend. To my darling friend, I know you will read this, and know it is about you! There is a space in my heart where you belong! My home is always open to you and my ears will be there for listening, my shoulders there for leaning on and any time you need it, a bottle of wine will be open for us to share. You are my sister from another mother! This pizza is a perfect meal for sharing – slice for slice, or bite for bite! 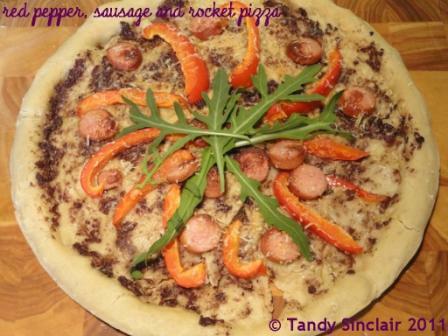 Olive tapenade and sausage sounds great on pizza. I usually just put a few oil cured black olives on top of mine. Now tapenade will go on the bottom. Tandy you are really lucky to have someone like that in your life. …and your pizza looks delicious. Looks DELICIOUS! Gorgeous presentation. I just made a similar pizza with some whole wheat dough, lots of hot peppers, and fresh garden basil! It is wonderful to have a friend like that – my sister (from the same Mother) is my soulmate!! you are truly blessed Pink! It’s true – that expression only makes sense once you meet that person – or realise what they mean to you 🙂 I’m lucky enough to have met mine! Love the pizza, I am a huge fan of using tapenade on the base. you always speak of your sister from another mother 🙂 The non tomato base makes such a difference I think! Aren´t we lucky to have friends like this (I have two especially close friends who are like sisters to me – it´s a shame they´re far away though). my friend is also far away from me!